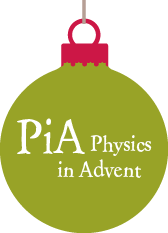 “Physics in Advent” is one of numerous activities and programmes which the German Physical Society (DPG) carries out as a non-profit association in accordance with its statutes. Further events and activities especially for pupils and teachers can be found at “Physics is fun ... and all around us". You can order our schools’ poster there as well. A great many physicists from all fields are members of the DPG. They are organised into different specialist, regional and also interdisciplinary groups, exchange information at meetings, and organise school competitions and advanced training courses. The DPG sees itself as a communication platform which establishes contacts between pupils, students, scientists at universities and research institutions, and physicists from industry and business, to provide insights into the working life of a physicist and make it easier to get a foot in the door. 11 issues of our informative members journal Physik Journal (in German) with exciting articles on the latest research topics, results, discoveries and prizes, delivered to your door. full access to the archive of Physik-Journal, which is very helpful when researching a particular topic and compiling presentations or term papers. information about the recent developments in the world of research and the activities of DPG in the form of short articles, podcasts and videos via our DPG app. Further information on DPG membership can be obtained here. You can apply for membership for yourself, or for a family member or friend via the DPG website, or you can fill in this form and send it to the address given. We look forward to welcoming you as members of the DPG very soon!